Mozambique's former finance minister Manuel Chang appears in court during an extradition hearing in Johannesburg. Three more days of hearings in Kempton Park magistrates court, Johannesburg have led to little change, with Manuel Chang still in jail and no decision on bail. Extradition and bail are dealt with by different judges and the next hearings will be Friday 15 February for bail and Tuesday 26 February for extradition. A bail hearing on Thursday 31 January saw the South African prosecutor, Elivera Dreyer, arguing strongly against granting bail. She said the former minister was extremely rich and poses a serious flight risk. Furthermore, the crimes Chang stands accused of are of enormous proportions. “Billions of dollars were stolen” she said, “and this has negatively affected the economy of Mozambique”. Dreyer insisted that the whole point of detaining Chang was to extradite him and this was not compatible with any provisional release. She pointed out that, once he is back in Mozambique, it will be impossible to extradite him because the Mozambican constitution specifically forbids the extradition of Mozambican citizens. The session continued the following day. But minutes after the session opened on Friday, there was a power cut, and it was discovered that the court generator had no fuel, so the session stopped. Today (Tuesday 5 February) was a joint hearing on bail and extradition, with two different judges. The bail hearing opened with the report that the Privinvest official being held in New York, Jean Boustani, had offered to post $20 mn in bail but the New York court refused bail. 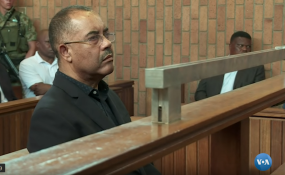 At the Kempton Park hearing Chang's defence lawyer, Rudi Krause proposed that if given bail Chang could stay in Johannesburg or even Kempton Park, where he has friends, but Dreyer continues to oppose bail. The decision will be announced on 15 February. The extradition session then started with a different judge. But the session was short, and was simply to allow the South African authorities to had over to the court and the defence the sealed package of extradition documents sent by the US Justice Department. Mozambique says that it has also submitted its extradition documents to the South African foreign ministry yesterday, but officials said they had not arrived in the prosecutors office. Carta de Mocambique (5 Feb) reports that the two extradition requests will be dealt with at separate court hearings by different prosecutors and judges.